I was so excited to get this that as soon as I got back in the car from the mailbox I put it in the stereo. Unfortunately my drive home is not that long. I loved what I had heard so far. But when I got home and wanted to listen to it on the computer (where I listen to all my music, so that I can write the review while listening) I hit a roadblock. See, it’s copy protected. Which means that it will not play in my computer. In fact, when I tried, it crashed my computer. Now I’ve come across many “copy protected” CDs in my journey here, and have yet to meet one that is really, actually copy protected. I tried all the work-arounds and nothing worked. So kudos to Jonatha’s tech team for actually making a copy-protected CD, but bummer for me since I can’t listen to it unless I’m in my car and it’s hard to balance my lap top on the steering wheel. After contacting Jonatha’s “people” I’ve learned that it’s just the advance copy that is protected. So those of you who are planning on purchasing this when it comes out, you should be fine. Whew! Go ahead, be free, buy away! 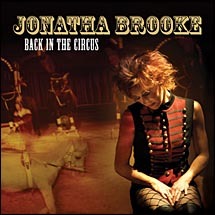 “Back in the Circus” is really a fantastic recording. I liked her 2001 release, “Steady Pull” very much. I loved the song “Linger” and many others, but the entire album didn’t grab me as much as this one does. Every single song on here is golden. I’d go so far as to say this is her best release yet. “”Back in the Circus” is a great opener, which I think is about getting back to touring and the stuff that goes with promoting a new CD. I think it’s also about accepting relationships again perhaps after one ended. Maybe I’m wrong, but that’s what I got from it…but what do I know? It’s a cool song and I’m so happy to be hearing that voice again! “Better After All” is the single, I’m pretty sure. It’s this CDs “Linger”. Definite radio hit. She does a great version of James Taylor’s “Fire and Rain”. It’s still a Taylor song, but definitely has got a Jonatha twist on it. Fabulous. She also has a couple of other covers and I will say I was a little worried about anyone covering “Eye in the Sky” (Alan Parsons). It just always seemed to me, to be one of those songs that only the original artist (and composer) can do. But it’s very nice. She did a beautiful job. “Less Than Love Is Nothing” was a big surprise for me. She uses some new toys in this one. There are a lot of extra electronica things that I haven’t heard on other Jonatha songs. If I’d heard this one the radio (and nothing would make me happier than to) I would have said, “Who is this? The voice sounds like Jonatha Brooke, but the music…uh-uh”. It’s really interesting and a very cool song. It’s been in my head for days. One thing that grabbed me about the CD is all the little production intricacies. There is a lot going on in the background. That’s not to say it overshadows the music, it doesn’t at all. Just enhances the songs, which like I said, are already really good. If you’ve been a fan of Jonatha’s in the past, this one will make you extremely happy. If you’re not familiar with her music, this is a great starting point. I’m pretty sure it will lead you to going back and purchasing her entire catalog.